Having lived in the Titirangi and Huia area all my life I have seen many changes. My Grandfather owned property near the landing at Little Muddy Creek. As a boy I helped make hay on his front paddock, now the Tangiwai Reserve at the intersection of Laingholm Drive and Huia and Landing Roads. I have herded cattle through Titirangi Village to return them home after their escape to feast in the gardens of outraged Titirangi residents (that was when the gravel road started at Lopdell House). 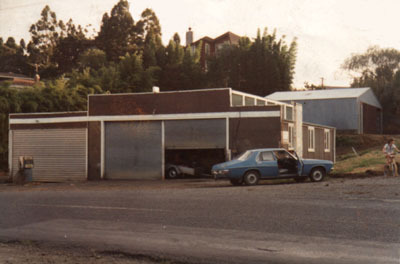 Being conditioned to love the area like all good Westies, my wife and I gave up commuting to central Auckland for work and purchased the old bus depot off Commercial Buses as pictured here in 1983. Although I had lived in this area all my life, I was unaware just how many residents there were hidden in the bush. From the day Helen and I opened the doors for business we were well supported by the locals. With their support we grew. As the area grew and our turnover and profits with it, we reinvested so as to keep abreast of the technical changes in the automotive industry. This lead to a complete rebuild of the premises in the summer of 1992/93. 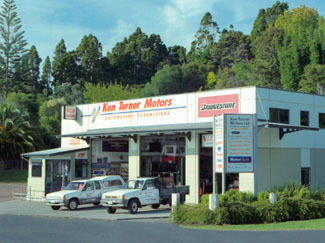 One of the reasons for a new workshop was the type of equipment required to service the rapidly-changing motor vehicle. Our old building was too damp to house the TuneScopes and other hi-tech electronic equipment needed for modern vehicle servicing. After erecting our new building there were comments from some locals that it’s appearance was out of character for our beautiful Titirangi area. Helen and I were aware of this and as profits allowed we have done our best to improve on that very commercial look.